If you didn’t see the “before”, here’s what it looked like after we painted over the aqua green that the previous owners had painted. Not bad, but you see what I mean about all the purple? A little overwhelming. But we let her pick, and this is what she asked for. I was missing what we had done in the condo with her little nursery, honestly. 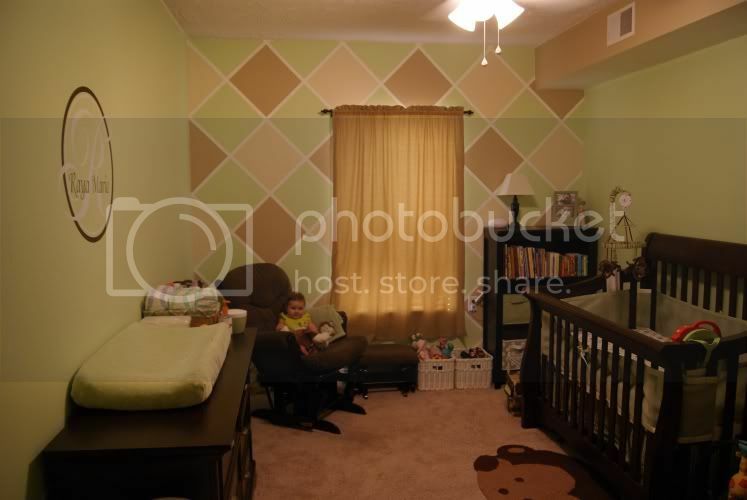 Back in 2010 I used Frog Tape® to create a color-blocked diamond pattern. I raved about it then (long before I even had a blog, much less had a great sponsor like Frog Tape®), and I still use it anytime I want sharp painted lines on walls or on furniture projects. The PaintBlock® technology in Frog Tape® has an absorbent polymer that gels with latex paint, forming a barrier along its edges. So you don’t have to worry about paint bleed – which is good, when you are painting things like dozens upon dozens of stripes. Speaking of which, I’d like to show you how it’s done! I wanted to lighten up the purple quite a bit, so I used 2 different, lighter shades. I placed my tape stripes in various widths – 20 inches, 8 inches, and 2 inches. I’m not sure if you can tell in the photo below, but I alos lightly marked in pencil which color I planned to paint each section, it helps a lot not to have to try to remember each time which part of the pattern you’re on. When you’re applying your tape, you want to get a nice firm seal along the edges. Just running your hand over each tape once is plenty to get your proper seal. Next, I just started painting! First once color, then the other. Because they are all shades of purple and I was using a paint with primer in it, one coat was plenty. For contrasting colors, you may want a second coat. But as soon as your paint is on the wall, just pull the tape off gently while it’s still wet. Awesome, right? Here’s a peek at the whole wall – the different widths worked great. The whole project only took me about 2 hours, plus drying time. If you love this idea, or it’s got your wheels tunring about what else you can do with Frog Tape®, check out the FrogTape how-to site, or follow them on Twitter (@FrogTape) for all kinds of creative inspiration! Do you have a project planned requiring stripes or patterns? Or are you thinking about one now? Leave a comment below, I’d love to hear about it! What a great idea! My granddaughter (lives with us) loves blue so she has…you guessed it–an all blue room. To break it up some, and add a bit of girly to it, we added a butterfly border around the center. Then we got butterfly and spring flowers garden vinyl stickers and scattered those around the room, but only above the border. I made curtains out of black material with varied shades of blue butterflies on it. Gorgeous! I used the same fabric to cover the unbacked, lower half of the shelf my hubby made for her. That hides the cords and cables plugged in on that wall and makes the shelf pop. But there’s still a lot of blue. Stripes just might do the job! Especially since she’s requested a horse theme this year. LOL I’m thinking a Fathead decal of her own pony as the focal point. :) Then horizontal stripes as “fencing”. I’m a craft fanatic, especially bead and fabric work, so LOVE your site! I’ll be getting my bead box back out soon and some of your ideas will be inspiring my creativity. :) I haven’t made friendship bracelets/chokers in a long time, or adjustable ones. It’s time. Love the stripes!! Super cute! !